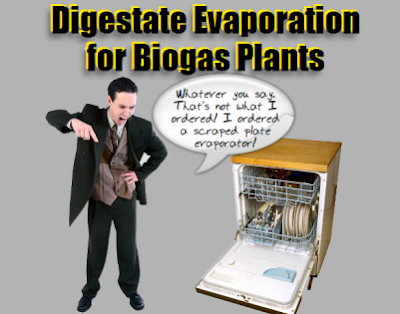 A Scraped Surface Evaporator is nothing like a dishwasher. In one you place your scraped plates and in the other it scrapes its own plates to prevent the heat exchange surface building up a furring which would eventually foul the heat exchanger and stop it working! In this article we consider the recent developments in liquid digestate evaporation technology, where evaporators can either be used to improve the marketability of the liquid digestate output from biogas plants by heat pasteurization, or by reducing volume the digestate to reduce disposal costs. Digestate in its raw form straight from the digester, is a heavy form of fertilizer, to transport to markets and the result of that is to make it expensive to deliver to markets which may be remote from the biogas plant. So, the sale of digestate in its much lighter and more concentrated crystalline form, after evaporation, may make commercial sense if the digestate is created in a region abundant in AD Plants such as a dairy farming region, but sold for use on arable land some distance away. The ability of an evaporator plant to reduce the volume of digestate for disposal can also be very useful where the AD process produces digestate which is unsuitable for agricultural use in its raw form, such as the digestate from Municipal Solid Waste digesters. Finally, before we provide details of some of the most interesting recent articles on this subject, and before anyone leaves us due to worries about the admittedly very substantial energy use of liquid digestate evaporation technology, let the reader not forget that many AD Plants are in isolated locations and therefore lack a buyer for their CHP power. In such circumstances, waste heat which cannot be exported from the biogas site as CHP to provide a direct revenue source, can at least be used in an evaporation plant. At the core of the HRS digestate process is an evaporation plant using HRS patented scraped surface evaporator technology that is self-cleaning and guarantees uninterrupted operation for periods of over 6 months. The Barkip plant will be the first of its kind to incorporate a novel digestate processing stage: Waste heat from the CHP engines is used to concentrate the liquid fraction of the digestate into a nutrient rich liquid fertilizer. Under the terms of the contract, the HRS technology will enable the Barkip Anaerobic Digestion plant to process 75,000 tonne’s of waste annually, in a plant setup that produces around 2.5MW of renewable electricity which will contribute towards Scotland’s renewable energy industry. So, it seems that much can be done to improve the value of digestate, and even potentially on some occasions, alleviate the problems for digestate sales which inherent when digestates fall to the demands of the Animal By-products Regulations. Your comments are welcome on this rapidly developing AD subject area, so please give us your thoughts on the use of Digestate Evaporators for Anaerobic Digestion Plants Add Product Value and Aid Disposal. We have been offline for over a month while IPPTS Associates moved location, during which time we have been unable to post our normal articles. To celebrate our return to posting to the Anaerobic Digestion Blogger Blog we decided to provide an example of that ever more popular source of internet communication: an infographic! We all like to update ourselves FAST! So here it is. Our top ten UK Facts About Anaerobic Digestion (and biogas production). This image is the copyright of IPPTS Associates. However, if you have a website and would like to republish and use this infographic, just email us with your request and no reasonable request will be refused.